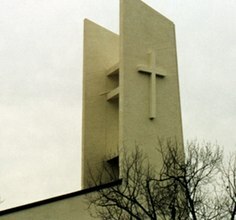 A money-making lease for a church at Redwood City, CA. Antenna is hidden. U.K. GASOLINE STATION SIGNS – IN AMERICA NEXT ? 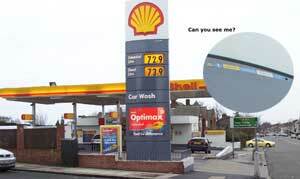 And do we know whether our petrol stations hide antennae within similar structures? antennae bases and sleep disturbance, fatigue, depression, irritability, headaches, infections, body discomfort etc. There are many adverse effects on well-being that have been repeatedly reported in populations living around mobile phone base stations (especially sleep disturbance, fatigue, depression, irritability, headaches, frequent infections, general body discomfort especially at night, allergies, etc – reported in detail elsewhere in these Powerwatch pages – see the our science section for a list of References). These are the things that should be being studied – but the MTHR has not funded any such studies. Elctrosmog and the demise of Honeybees: who will pollinate the food supply? While traction continues to mount against the cellular operators for harmful effects of cell phone use, a new and growing concern arises as U.S. honeybee populations continue to decrease. 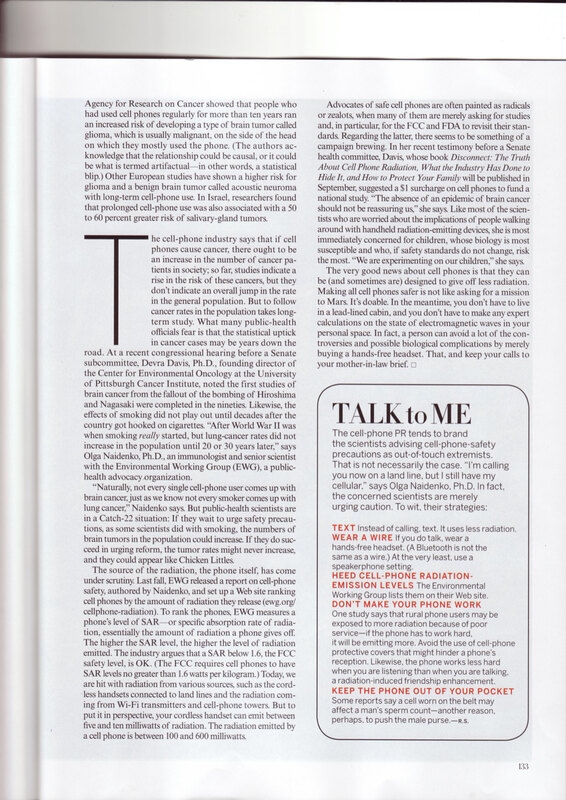 Advancing biologically-based EMR exposure standards that serve the best interests to protect public health and our natural environment are likely to be those new standards to unfold sometime in the near future as more research continues to show that cell towers and other sources of EMR negatively impact nature’s operating frequency. A local Washington, DC area telecommunications services company executive filed an informal complaint with the FCC stating that the GSM mobile system is modulated at 217 HZ and interferes with the honeybee “natural” operating frequency that is 180 – 250 HZ. The complaint cites research dating back to 1974, from the Russian researchersEskov and Sapozhnikov that found bees generate electromagnetic signals with a modulation frequency between 180 and 250 Hz when they do their communications dances. Hungry bees react to those frequencies by erecting their antennae Research done by Ulrich Warnke reported that the communication impulses of the antennae when touched by a fellow bee can be measured with an oscillograph and that in the presence of strong electrical fields bees communications is disturbed and they become aggressive while stinging one another to death and will leave the hive if possible. REHAAN DASTUR, 46, is an engineer and an industrialist. he owns and runs a profitable Delhi-based boiler manufacturing company called Universal Boilers. So, it is safe to say he is a man of science and not prone to paranoia. Dastur was one of the first users of the cell phone in India. he bought his phone from airtel in October 1997, 15 days before it was commercially released. Cell phone calls cost rs 18 a minute then. Dastur spoke on his phone for hours on end at times. He continued to use the phone even though it had fallen and had developed a crack, because cell phones then were expensive and the crack didn’t affect his phone’s efficiency. Three years after doing this, in 2000, Dastur suffered a stroke that paralysed his body and distorted and froze his face. The doctor treating him at Delhi’s Apollo hospital told him he had Bell’s palsy, caused by Electromagnetic Radiation (EMR) emitted from the antennae in his cell phone. The emr travelled through the crack in the phone, into Dastur’s ears, nerves and brain. There is no other way to say this. Radiation levels of the non-nuclear kind in Delhi may have reached way beyond what humans can live with. Almost four-fifths of the metropolis has people living in the midst of radiation levels ranging from “borderline” to “unsafe” and “extreme anomaly”, which are highly unsafe. Only about a fifth of Delhi lives and works in the safe zone and that is almost entirely where the vvips reside. The October Commonwealth Games, over 12 days, could be the most radiation-filled sports event ever. 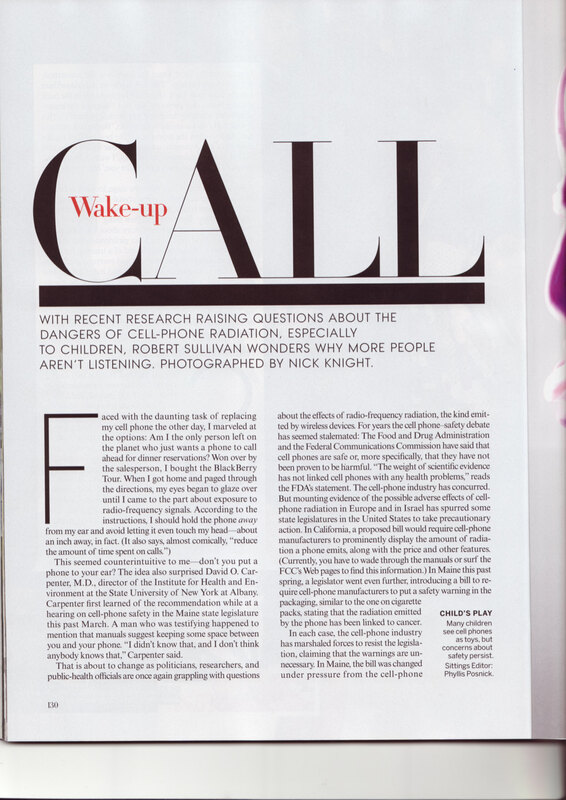 Visit Eliehouse site to read the Vogue article Wake-up call in full. 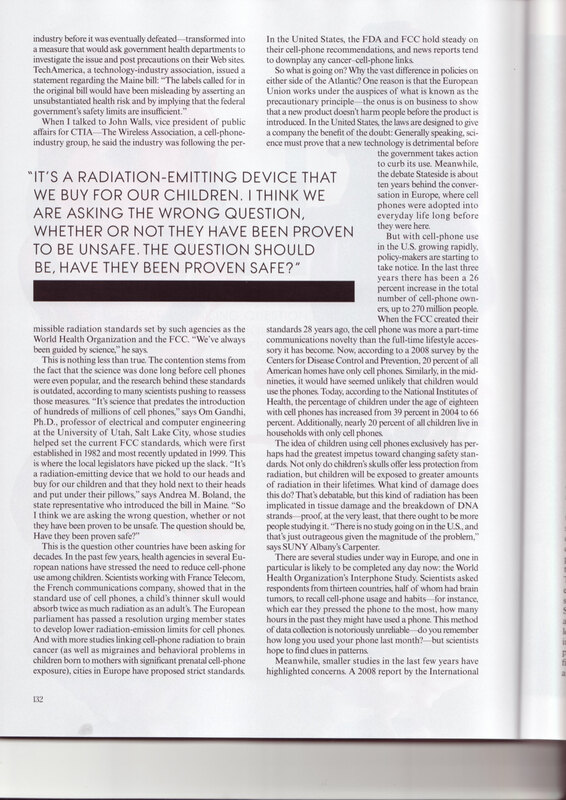 “It is a radiating-emitting device that we buy for our children. I think we are asking the wrong question, whether or not they have been proven to be unsafe. The questions should be, have they been proven safe.” Robert Sullivan talking about the use of cell phones. for the full text of the ‘wake-up call’ – Vogue article, click on the following links. wake-up call page 1 Once opened, right click on the page to enlarge.